Pune: Auto maker Mahindra Renault Pvt. Ltd has scaled back production of Logan sedan by at least half, after sales sharply fell in the past months. The car maker will produce about 1,000 Logans at its Nashik plant in November, compared with the average 2,500 units a month it had been rolling out hitherto, suppliers familiar with the development said. Vendors and business associates of Mahindra Renault Mint spoke with for this story did not want to be identified, citing confidentiality agreements with the company. A company spokesperson said chief executive Nalin Mehta was in France and could not be contacted for comment. Mahindra Renault, a venture of India’s biggest tractor maker Mahindra and Mahindra Ltd and French auto company Renault SA, had invested Rs700 crore in the Nashik facility and had initially aimed producing 50,000 cars a year. The sedan’s sales have been steadily declining this year as an economic slowdown and high interest rates kept customers away. After reaching a peak of 3,068 units in March, sales dropped to 1,531 cars in May, 1,464 in August, and 1,067 in October, a festive month that typically sees more car purchases, according to monthly sales data put out by the company. Indian auto sales typically slow after the festival season in October because cars bought in November or December get tagged with the vintage of that year and could see a dip in resale value in future. Sales pick up in January as consumers wait to buy that year’s model. Some car makers also shut production for a week in December for scheduled maintenance, but a scaling back by as much as 50% is rare. Some of India’s top auto manufacturers saw their October sales drop this year and are also likely to slow production. “(Logan) sales have been sliding continuously and, while other manufacturers are also witnessing a slowdown, the performance of the Logan in the marketplace is worrying, since a lot of time and effort has been put in by us for this project," said one vendor. “It is a cause for concern when the vendor is asked to plan for 3,000 units per month and suddenly we are asked to scale this down so much." Mahindra Renault, looking at ways to drive sales, is offering to sell the Logan to its suppliers and business associates in 35 cities at a 10% discount, two vendors said. The offer is open for its 1.4 GLE, 1.6 GLX and 1.6 GLS models in the entry- and mid-segment range. Mahindra Renault is not the first car maker to turn to its vendors and business associates with special schemes when the going gets tough. Last year, the country’s largest car manufacturer, Maruti Suzuki India Ltd, sought to fuel demand in the face of rising interest rates by offering lower rates to auto parts makers and their employees. Then managing director Jagdish Khattar promoted the project, travelling to Mumbai and other cities to meet at least 200 vendors. Maruti did not comment on the response to the scheme when contacted by Mint. Mahindra Renault recently launched a new line of Logan cars with additional safety and convenience features, and had manufactured 3,000 units in October in anticipation of increased sales during the festive season. Car sales in India fell for the first time in 2.5 years in July-August as the economy slowed significantly and interest rates climbed. Sales for Maruti Suzuki dropped 7% year-on-year in October, while that of Tata Motors Ltd dropped 6%, according to monthly sales data from the companies. 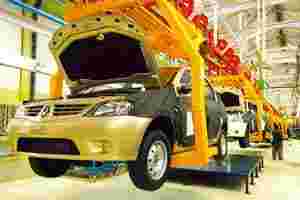 Two months ago, trade body Society of Indian Automobile Manufacturers lowered its sales growth outlook for the industry in 2008-09 to 8-10% from 12-15%.